I had passed over this section of creek in North GA a week earlier, it’s tight, overgrown and barely 5-feet wide. 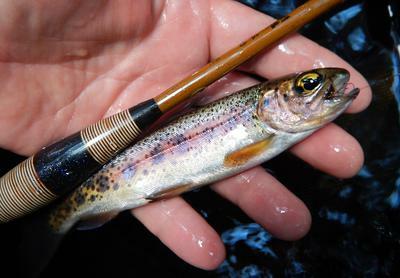 On this day I returned with a 4-foot Nissin Sasuke and caught seven wild rainbows 5"-7". Andy- it is a size 14 barbless JuteBug...you won't find a photo of it anywhere, it's something I make up using jute twine, this one I blended jute with pheasant feather. Post a picture of the fly you used. Andy that's another post someday. What was the water depth, and what type of leader/tippet length were you using. Was the water flowing or pools. Weighted or unweighted fly. Andy, it's Tenkara style, rod is 4-ft, line about 6-ft of 3.5 level line, about 2-ft of 5X tippet, non weighted fly, water depth 1-ft to 2-ft, moving water slow to fast, no pools, water temp 64-66°F, air temp around 90°F, waded wet, total distance covered less than 100-yrds.